Confucius (孔夫子) was a great philosopher and teacher in China 2,500 years ago. His teaching was canonized as China’s state philosophy 2,000 years ago during Han dynasty and has occupied an esteemed position until it was vilified by Mao during the Cultural Revolution. Recently, Confucius appears to have been rehabilitated as China slowly revitalizes his codes of ethics in China. Chinese government established about 500 Confucius Institutes throughout the world to familiarize other countries with Chinese culture and language. China Institute of New York City has put together an exhibit of Confucius’ life. It borrowed artifacts and treasures from the museums and Confucius’ temple and should be an excellent show. 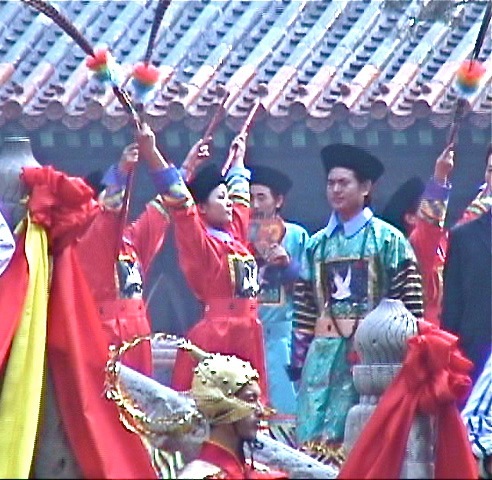 Sally and I took a trip in 2004 to QuFu (曲阜) in Shangdong (山東) to observe Confucius’ birthday ceremony at the Confucius Temple (孔廟). It was an elaborate affair with many hundreds of participants and thousands of spectators. 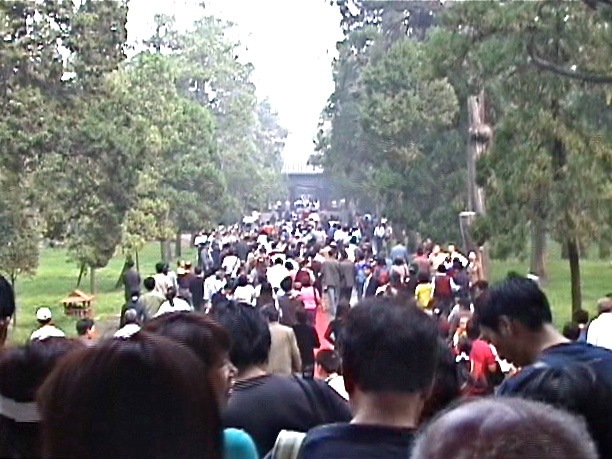 The mad rush to enter the temple started as a stampede, but then settled down into just a jostling mob. 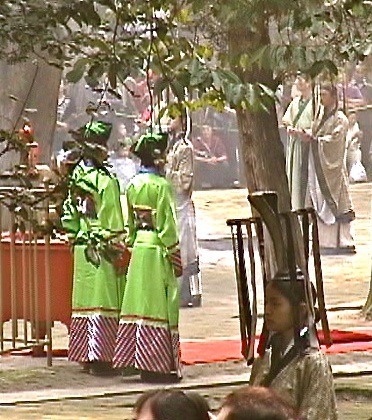 The ceremony started when participants, dressed as Qing Dynasty officials, filed past the temple gate into the temple. 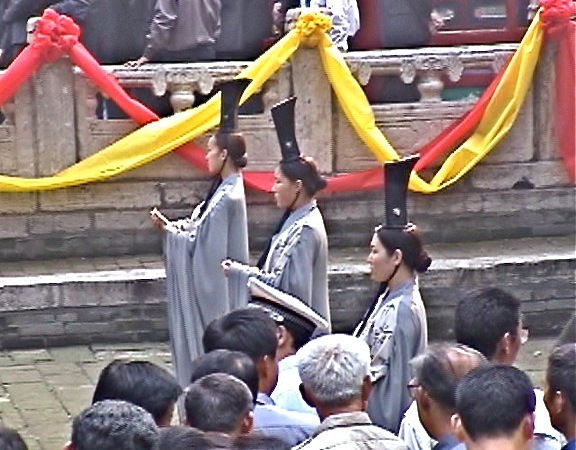 They were followed by hundreds of descendants of Confucius, ranked by seniority in the family hierarchy. The current generation of his descendants is the 80th generation. Compared to that, I am the 76th generation of the Wu (伍) family. 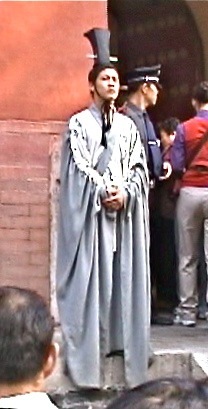 A dignified attendant dressed in traditional Hanfu (漢服) from Confucius’ time stood guard next to another guard in Western uniform. One attendant greeted spectators with ancient hand gesture. 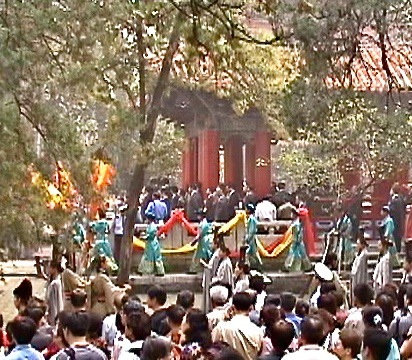 Confucius’ descendants gathered under central pavilion during the ceremony. The crowd was less reverent and more curious about the ceremony. But at least they did not yell loudly nor surge beyond the barriers. 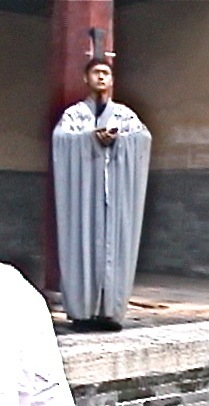 Participants dressed in Hanfu accompanied the descendants during the ceremony. We were amidst a crowd of thousands and could barely see the ceremony. What we saw were blocked by the many trees and people. 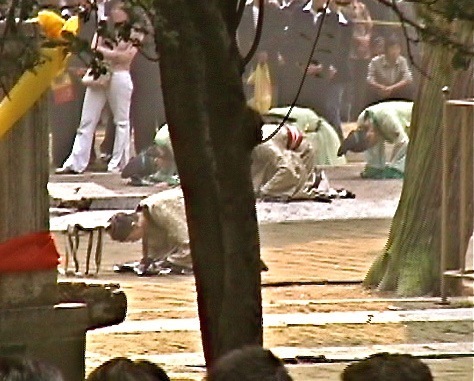 The participants in Hanfu kowtowed (叩頭) repeatedly with Confucius’ descendants. 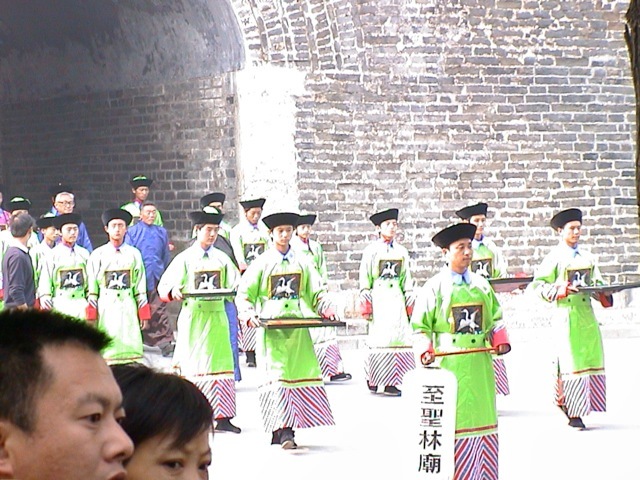 One curious sight was the simultaneous appearance of participants dressed in stiff Manchu clothing, in green, and in elegant Hanfu, in white. As Hanfu was forbidden by the conquering Manchus 400 years ago, the traditional Hanfu was eliminated from the Chinese general culture. I was glad to see many of the participants were dressed in the flowing Hanfu. On the altar platform, participants performed the traditional ceremonial dance. I wish they wore Hanfu to be more authentic. 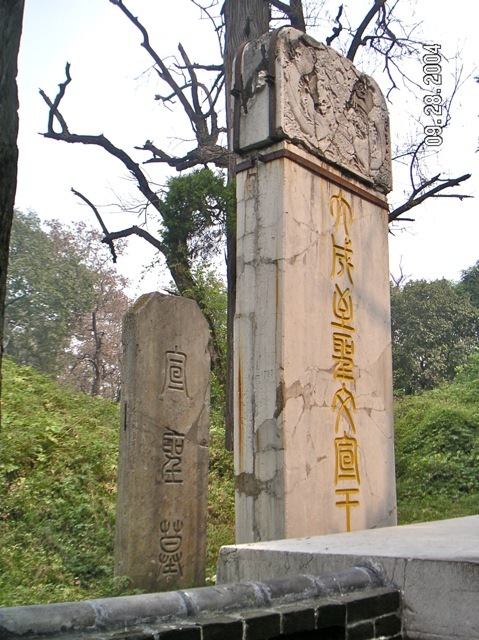 For 2,000 years, Confucius had been honored by successions of emperors. A large estate was granted to his descendants and a great mansion with 500 rooms was built to house his descendants. A temple worthy of imperial dignity was built in his honor, and a large grave yard was set aside for his family. Yellow tiled roofs and buildings with nine jian (間, space between columns) were reserved for imperial houses. 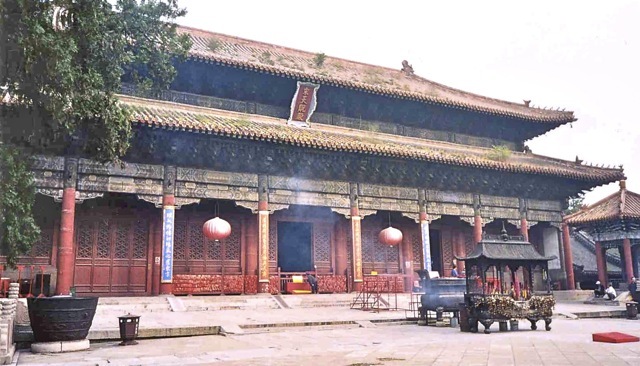 Confucius’s temple was granted the honor of imperial construction, and emperors made periodic pilgrimages to the temple to honor Confucius. 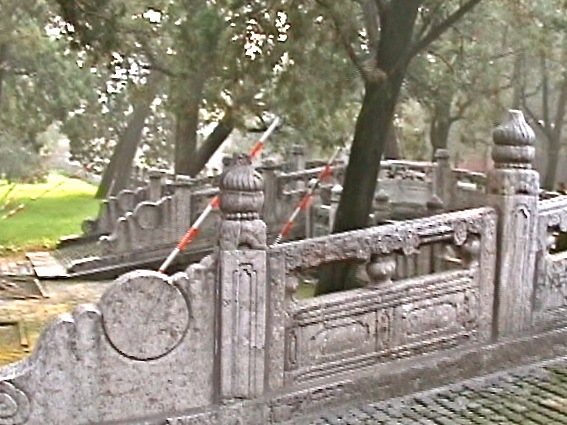 Confucius’ grave was destroyed by rampaging Red Guards during Mao’s Cultural Revolution. His tombstone was smashed and his copse was desecrated. This tombstone is evidently rebuilt from smashed parts. Posted by Robert Wu on Friday, March 26, 2010, at 7:09 am. Filed under Uncategorized. Follow any responses to this post with its comments RSS feed. You can post a comment or trackback from your blog.